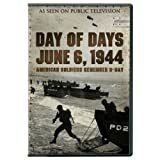 DAY OF DAYS: JUNE 6, 1944 - AMERICAN SOLDIERS REMEMBER D-DAY brings together American D-Day veterans to share their experiences from that fateful day. As they vividly recall details from their ordeal - from the perils of the amphibious assault to the invasion's gruesome aftermath - their testimony yields long-buried and often painful memories. D-DAY 360 re-creates the landscape and uses fresh new data-driven and statistical tools to tell the story of one of the greatest invasions in history. D-DAY'S SUNKEN SECRETS explores how some of the innovations deployed in the invasion led to the Allied Forces' successful campaign. David Tennant (Doctor Who, Broadchurch) narrates this exhilarating six-part series that takes viewers over the planet's most incredible landscapes and reveals what it's like to fly like a bird. Filmed over four years with help from camera-carrying birds, drones, paragliders and remote-control microflight planes, Earthflight brings a whole new meaning to the phrase 'birds-eye view' by combining state-of-the-art technology and sophisticated techniques to show the world from an incredible aerial perspective. Written and directed by the incomparable John Hughes and starring comedy greats Steve Martin and John Candy, the uproarious classic follows a businessman who is struggling to get home for Thanksgiving, but burdened by one travel mishap after another, as well as the company of an annoying traveling salesman.